We know the iPhone is going to be center stage on Monday. But maybe you don't want a new iPhone, you want one more thing. 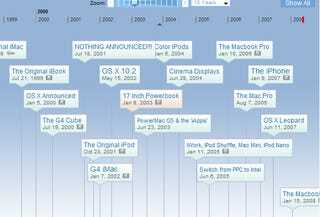 Cult of Mac has convenient interactive timeline of big announcements from every Stevenote (with video!) so you can figure out what's more likely than not, using history as a guide.